No matter how many times you immerse yourself in Sergio Leone’s languid, lovely and lengthy ode to Lower East Side mobsters (more specifically, mobster films), the same questions always float through your frontal lobe like Prohibition-champagne bubbles: Is Noodles (Robert De Niro), the film’s protagonist, a tragic, Gatsby-like figure or merely a majestic Jewish version of his paesan Method hoods? 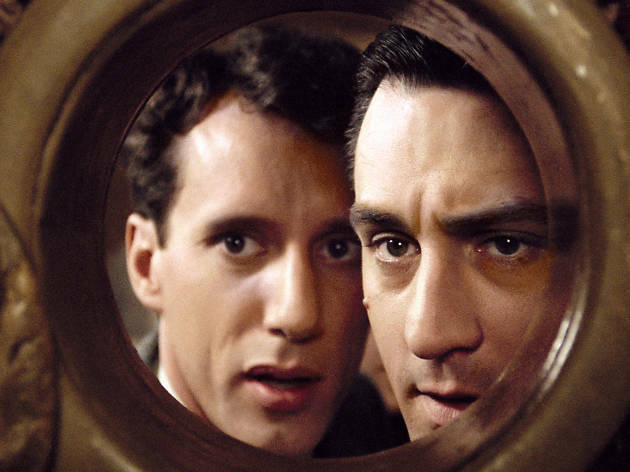 Do the stellar performances from De Niro and James Woods make up for the amateurish acting of their younger counterparts? Is this dense dissection of the American Dream really just one druggie’s opium fever dream? Did Leone make a genuine masterpiece or simply the most Proustian gangster movie ever? What’s indisputable is that Leone’s project was both a personal labor of love and an attempt to out-Godfather Coppola’s Godfather saga, complete with extravagant tommy-gun slaughtering, sweeping Delancey Street–diaspora shots and some seriously chronologically skewed hopscotching between time periods. That last part is where the Italian director’s baroque approach to genre flicks becomes downright visionary (the endless ringing-phone transition! ), which naturally meant it was the first thing to go in the Great Studio Cutting Room Massacre of ’84; though Leone’s longer version has been readily available for eons, the digital-cinema-package restoration adds a layer of visual luster that emphasizes the movie’s burnished take on memory and the past. Seen today, this rise-and-fall chronicle will make you nostalgic—not for the days of New World shtetls and Borsalino-wearing bad guys, but for an era when giants walked the earth and made excessive epics with scope, substance and a true sense of cinematic grandeur, once upon a time. This epic movie is perhaps, amongst other things, the saddest film I've ever seen because of the wastefulness of it's leading character. At every turn "Noodles" faces opportunities with potentially huge benefits but wastes them on the "here and now". As previously mentioned by another contributor, the editing of the film is superb but one needs to concentrate because of the jumping backward and forth in time. The soundtrack is iconic and adds to the sadness one feels when thinking of the final outcome. I am of the opinion that this is a more complete film than either of the Godfather films (1 and 2). It certainly, for me, stirs more emotion. The acting is sublime. 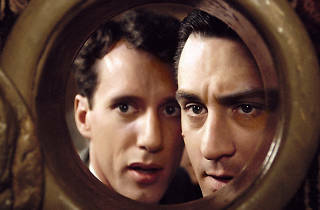 Robert DeNiro and James Woods are so good in this film that they scarcely need dialogue. One can almost decipher what they're thinking from their facial expressions alone, and despite repeated viewing I always find something new to marvel at. It is a gem. A fabulous movie of friendship, graphic violence and behavior. David "Noodles" Aronson rehashes his life and friendships' escapades in the crime-ridden poverty-stricken, Jewish streets of New York. He and his lifetime friends become gangsters by the time they are 12. Noodles has a crush on the young Deborah (Jennifer Connelly), who teases but does not reciprocate; for she knows he is destined to an unsavory life. He continues to pursue her after a 12-year prison stint for killing another teen who killed his friend. It goes nowhere because he is still tied to the tails of his criminal friends. He spends the latter part of his life bemoaning the fact he tipped off the police on a robbery to save his friend's life from an impossible robbery attempt. The result was death for his friends. Thirty-five years later he learns what really happened and the fates of those around him.